Andersen windows by Perma View ,(One of the Only Certified Andersen Window Installers in Central Ohio) specializes in window and door replacement and has been providing people in Columbus and Central Ohio with better views since 1980. 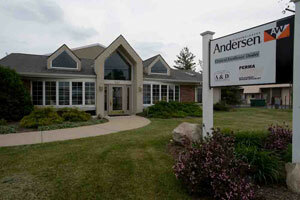 Our showroom has one of the largest displays of Andersen Windows in all of Ohio. Our trained staff has won awards in both product knowledge and achievements and is fully prepared to help in every aspect of your planning. Visit our online product catalogue. We are members of NARI , BBB and Angies list. 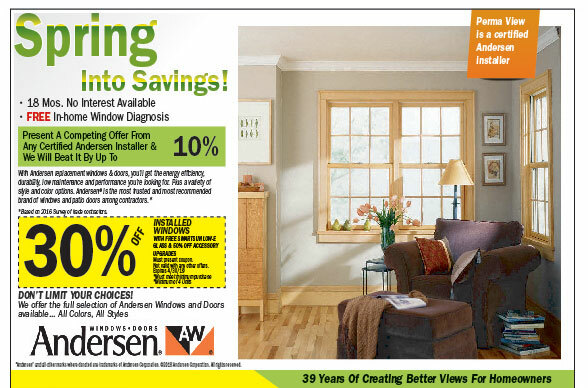 At Perma View we believe that Andersen has received these many accolades based on their commitment to make windows that are different and better and then stand behind those products with comprehensive support and one of the best warranties in the industry. Just in the last year Andersen has changed the 400 Series Tilt Wash Double Hung product line to have a higher Performance Grade, received the Energy Star® Partner of the Year Award for Sustained Excellence, launched an easy tilt-release locking mechanism for the Woodwright Full Frame and Insert Double Hung Windows and announced the availability of custom sizing on the industry leading 400 Series Tilt Wash products. Perma View is proud to have a partner in Andersen that is constantly looking to improve and is consistently regarded as one of the most trusted brands in window and door manufacturing. Perma View provides free in home no pressure consultations. You wont need to set aside hours of your time. Perma View does not spend a lot on advertising. This saves you money compared to those who do. Perma View will provide a turn key installation from start to finish. Perma View offers Wood windows, Vinyl windows ,Fibrex windows. The wood windows can have a maintenance free cladding such as Fibrex, aluminum , vinyl and fiberglass. Don’t wait to long to take advantage of this giant sale. Installation – Ensure proper installation of windows to maximize their energy efficiency. Being a Certified Andersen Installer assures you of a quality installation and a longer Warranty backed by Andersen. Outcome- Be sure to consider what the windows will end up looking like. Its not easy to replace windows and make them look original. We work hard to maintain glass and proper sizing to minimize exterior and interior trim.